Works with 11ac and both single and Dual-Band signals, so extend great Wi-Fi whatever your router. BT's 11ac Dual-Band Wi-Fi Extender 2600 has been designed to work with any service provider to make sure everyone can make the most of their Broadband at home. BTs 11ac Dual-Band Wi-Fi Extender 2600 is easy to use, just plug the device somewhere in the home and link it up to your router, use the range indicator lights on the unit to find the best location in your home to improve your Wi-fi range, and you are ready to enjoy a complete broadband wi-fi experience. 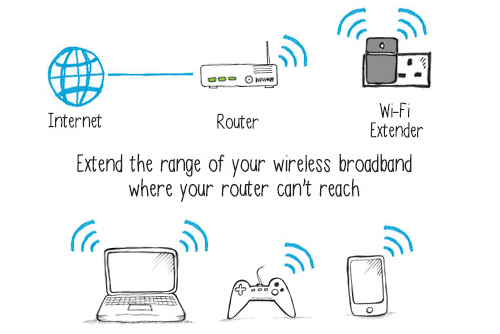 You are able to connect any wired or wireless device wherever and whenever you like. BT's 11ac Dual-Band Wi-Fi Extender 2600 can support all your online needs with up to 2600 Mbps for smooth HD/3D streaming, online gaming or faster downloads. BT's 11ac Dual-Band Wi-Fi Extender 2600 will help you solve a variety of broadband problems you might have around your home. Connecting up a PC for an online gaming experience or Smart TV, freeview boxes and laptops. BT's 11ac Dual-Band Wi-Fi Extender 2600 will help you alleviate these problems and make the most out of your broadband at home. BT's 11ac Dual-Band Wi-Fi Extender 2600 is Dual-Band ready, allowing you to operate on both 2.4 GHz and 5 GHz Frequencies, so long as your router allows it. 2.4 GHz is the default frequency, therefore any device you use will connect to this frequency unless you select otherwise. 5 GHz has a smaller range than the 2.4 GHz but there will be significantly less interference since there are less devices using it. The BT 11ac Dual-Band Wi-Fi Extender 2600 has 11ac technology, which drastically increases the speeds that data travels with a 5 GHz connection.